If you close your eyes on downtown Broadway these days during business hours, you are almost more likely to hear an English, Scottish, or Irish accent, than an American one. 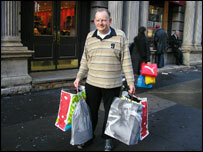 The great European shopping invasion of New York is in full-swing, with Britain leading the charge. Sterling and the Euro are riding high against the US dollar, and cheap transatlantic flights abound. "The shopping pays for the whole trip. If you want a weekend away, for nothing - this is the place," said Gary Chute, 41, who was visiting New York with his wife Samantha, and their friends Chris and Claire Sills. "Seven hours, and you're here. If you get the early flight you can be in the shops at lunchtime," said Chris, 33, holding up a full bag of new clothes from the discount designer store near Ground Zero, Century 21. The foursome are veterans of the New York shopping scene: "It feels like we've spent 90 per cent of our time shopping, and around ten per cent sleeping," said Samantha. Her prize bargain of the trip had been a pair of Diesel trainers on sale for $40 - a quarter of the price she'd have to pay back home in Surrey. "There are loads of Brits and Irish here. I even bumped into one lady I knew," said Gary. They arrived at their midtown hotel on Thanksgiving Day - when most stores are closed - but were in Toys R-Us at seven the following morning, to begin a full day of relentless spending. "The bags we've got with us now - this is nothing compared with what we've got back at the hotel. We've got very big bags," said Claire, beaming but clearly exhausted. They wandered off up Broadway in search of a long late lunch, before boarding an evening flight home. Passing by on the same stretch of busy pavement, Graham Petherick, 46, was also laden down with goodies from several hours of intensive clothes shopping. "It's basically the same price in dollars as in pounds back home in London," he said with a contented sigh. He was steering clear of buying anything American that you need to plug in, for fear of electronic incompatibilities. Clare Grantham, 29, had no such qualms. I met her coming out of the Apple Store in the heart of Soho - a busy downtown shopping district that 20 years ago, was home to New York's impoverished art crowd. "So far I've bought a watch and an i-Pod," said the euphoric media researcher, who had been in the city for less than 24 hours. "Shortly I'm going to get a lot of clothes, trainers -possibly some records - and it's all for me!" Having saved around £60 on her Apple purchase compared with UK prices, she said she was looking forward to a full week of letting her pounds go a long way: "I'm loving it already here - I may not be leaving." It's not only the British and Euro-zone customer who is enjoying the current boom. 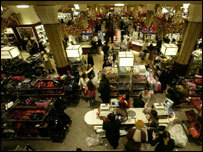 Many of New York's downtown store owners appreciate their purchasing power and its impact on their businesses. "Over 40 per cent of our business now is coming from European tourists," said Julia Lee, who is weekend manager for an upmarket fashion store on Broadway. "After 9/11, our figures went really down; however in the past few months we've been doing pretty well thanks to tourists," she added. The only downside for her family-owned store is that imported goods from places like Italy now cost them more, thanks to the weak dollar. She said: "I had one British customer who bought four pairs of shoes, and spent about $800. We can tell who comes from where by the credit cards. We're definitely getting many English, French, Italian and Spanish. They love our styles." But while New Yorkers in the downtown shops are enjoying the influx of high-spending Britons, others in the service sector are not so chuffed. It is a long-established practice in New York's bar and restaurant trade to leave tips of 15-20 per cent - even for a pint of beer at the bar. "We've noticed a lot more Brits coming in, but, well - shall I be honest?" said Jennifer, one of the bartenders at Fanelli's, a beloved Soho institution that has a faithful crowd of regulars. "They're lousy tippers. Sometimes there are just a couple of dimes on the table after running up a big tab," she said with a look of mild outrage. As we talked across the weathered dark-wood bar, another waitress walked by, nodding her head vigorously at the suggestion that perhaps UK visitors could be a bit more generous. "That's especially true given that your currency is so strong right now. Maybe you guys could bear that in mind?" she added with a grin.